This weekend, the Bureau of Street Services will be repaving parts of 1st Street in Downtown Los Angeles. After the repaving, the street will be repainted. Part of the repainting will include removing the buffer from the 1st Street Buffered Bike Lane in front of LAPD headquarters between Spring and Main Streets. The good news is that the buffer will remain for the rest of 1st Street and the bike lane itself will be undisturbed. The bad news is that the LAPD officially asked that the buffer be removed and LADOT agreed. The parking lot for LAPD headquarters requires nearly 100 yards of extra walking as compared to the headquarters. Downtown cyclists complained about LAPD cruisers parking in the lane since it was painted, and the result of those complaints seems to be removing the buffer so the police can resume curb parking in front of the headquarters. By removing the buffering in front of LAPD headquarters, the LAPD is sending a message that it was more interested in non-emergency parking (a police car can park in any lane in an emergency, so this was never about access) than road safety. Cyclists proposed several alternate solutions that were never considered very seriously including making the lane L.A.’s first cycle track or protected bike lane or using plastic bollards to keep the lane clear of all but emergency vehicles and cyclists. Downtown cyclist Roger Rudick makes the case for keeping the lane in a previous story on Streetsblog. After nearly two years of good relations, cracks seem to be appearing in the collaborative relationship between cycling advocates and the LAPD. Two weeks ago, the LAPD successfully campaigned to increase speed limits on some streets in the Valley over a year after safe street advocates beat back the last speed limit increase proposal. Now it seems an LAPD lobbying effort will remove a safety feature for one block, creating a somewhat confusing road configuration, to increase non-emergency access to LAPD headquarters. This is hardly the first time LADOT and LAPD have quietly worked together to remove bicycle infrastructure. In 1999, one of the early campaigns of the Los Angeles County Bicycle Coalition preserved a bike lane at the LAPD Station on Venice Boulevard near La Brea. After a heated campaign, mixed-use travel lanes were narrowed instead, and LAPD’s non-emergency curbside parking rights were preserved. Even as the buffered lane’s removal is eminent, advocates still don’t actually know what the LAPD’s complaint against the bike lane is. 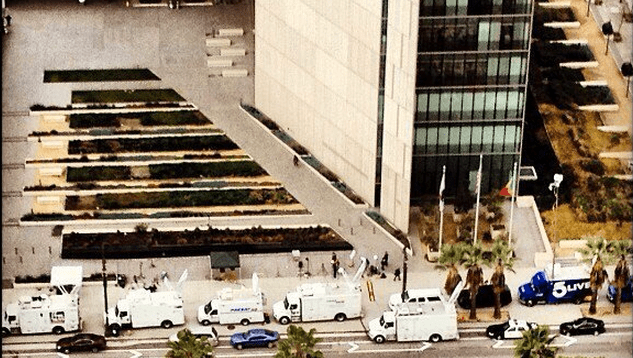 Advocates and journalists assume it has to do with access to the headquarters, but requests to LAPD for the exact cause of the complaint have yet to be answered. How much is this going to cost the supposedly “broke” city?? Meanwhile the LAPD’s Troy Williams the so-called “expert” on speed enforcement continues to conspire with LADOT Senior Transportation Engineer, Brian Gallagher to RAISE speed limits rather than do their actual jobs which is to make the streets safer for ALL road users. Yay city government. The LAPD headquarters has over 1,000+ parking spaces. One thing DTLA does not lack is parking spaces. This is unbridled arrogance protected by a badge. Politicians do the same thing with their vehicles. The painfully obvious solution is to allow squad cars to park IN the buffer, which basically makes the bike lane even safer. How was that not even considered? A buffered bike lane next to the curb in downtown LA is a bad idea. All it takes is one driver parking there, and others will follow. There needs to be some sort of a barrier to separate the moving traffic from the curbside bike lane. But, unfortunately, that would be considered a “experimental” design by the LADOT, since it is not written down in any of the manuals that they refer to. Some good news is that the federal highway administration, which has refered traffic engineers to the antiquated AASHTO guide book for bicycle infrastructure, is having the DOT work on writting their own safety standards for bicycles. by the looks of those media vehicles… they will be perched IN the new bike lane a plenty. THANKS LADOT/LAPD DINOSAURS. i might add that there is a chronic problem with media vehicles parking on the sidewalk and not allowing for disable access in front of the laid headquarters. when i went to file a complaint i was told by the security guard that the officer that i needed to talk to was not available and that i should call him later in the day. that does nothing to solve the immediate problem. The law unto themselves. LAPD has a history of bad actions against the citizens they are supposed to protect and serve. They are all fit and need to walk from their 1000 car parking lot.